Lake Region's field hockey team celebrates at the final horn of Tuesday's 4-0 win at Freeport in a Class B South quarterfinal. The Lakers go to three-time defending state champion York for the semifinals this weekend. Joe Carpine / 365digitalphotography.com photos. More photos below. 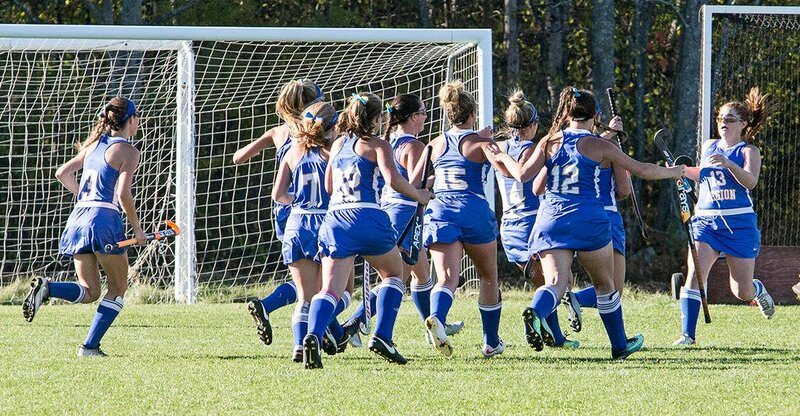 Lake Region’s field hockey team celebrates at the final horn of Tuesday’s 4-0 win at Freeport in a Class B South quarterfinal. The Lakers go to three-time defending state champion York for the semifinals this weekend. 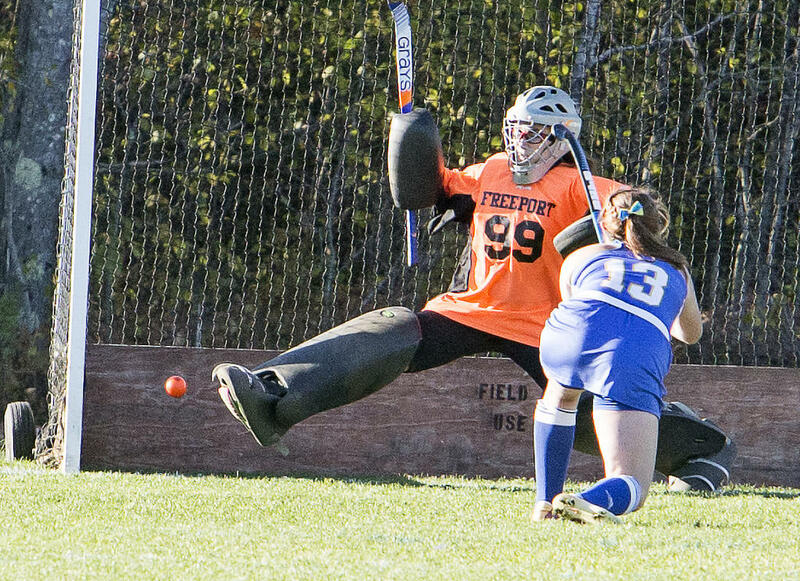 FREEPORT—All good things must end, but the end came far too abruptly and painfully for Freeport’s field hockey team Tuesday afternoon at Hunter Road Fields. The Falcons, on the heels of their finest regular season in nearly a decade, got to host a quarterfinal round playoff game on their home turf for the first time since 2007, but they had the misfortune of facing a red-hot Lake Region squad, which came to town confident it could continue its recent surge. The fifth-seeded Lakers controlled play the majority of the first half, but couldn’t break through. Then, in the second half, the floodgates opened. With 24:47 left, Lake Region got its first goal, and as it turned out, the only goal it would need, as off a penalty corner, senior Olivia Deschenes fired a shot just inside the far post for a 1-0 lead. The Lakers doubled their advantage with 19:11 left, when junior Paige Davis converted a penalty stroke. After fourth-ranked Freeport showed some life on offense, only to come up empty, Lake Region delivered the dagger with 9:48 to play, when sophomore Delaney Meserve finished in transition. One final goal by Deschenes out of a scrum with 7:04 on the clock ended any remaining doubt and the Lakers went on to a decisive 4-0 victory. Lake Region improved to 8-7, advanced to take on top-ranked, three-time defending Class B champion York (12-2-1) in the semifinals this weekend and in the process, ended the Falcons’ memorable season at 9-5-1. Freeport has been competitive in recent seasons, but the Falcons took the next step in 2017, living up to the preseason hype and earning attention not only from the media, but also the best effort of every foe they faced. Freeport started with a tie at Greely, then rattled off five straight victories to serve notice it would be in it for the long haul. While the Falcons split their final eight contests, they were competitive in all of them (see sidebar, below, for links to previous game stories) and their 9-4-1 mark, the program’s best since 2009, gave Freeport the No. 4 seed in Class B South. Lake Region, meanwhile, has rebounded from an 0-13-1 season with abandon. The Lakers opened with a victory, then found themselves 1-4 before winning six of seven. 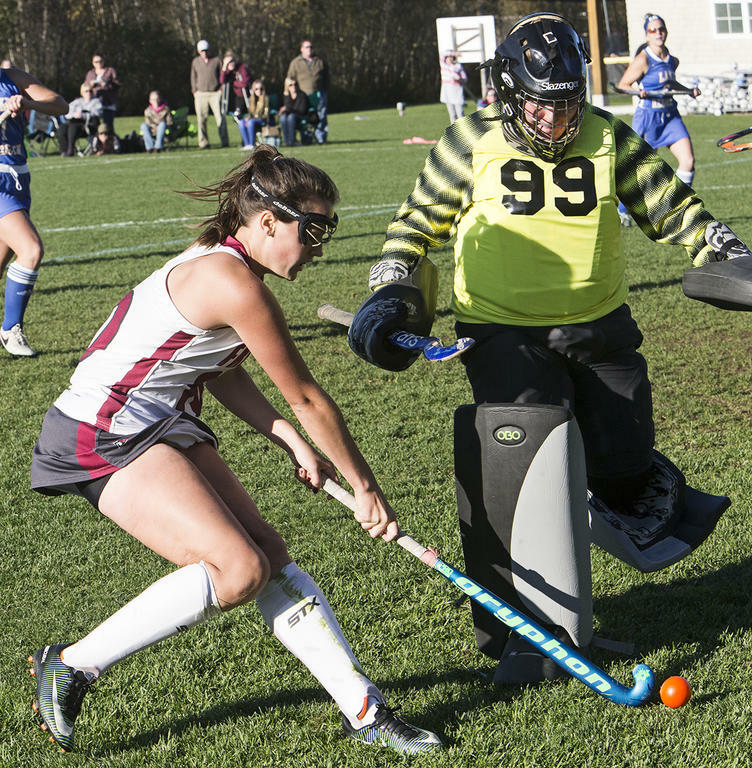 Lake Region then finished with close losses to York and Yarmouth, the region’s top two seeds. Freeport and Lake Region played back on Sept. 8 when junior Natalie Anderson’s goal held up to allow the Falcons to win at home. Prior to Tuesday, the teams had never met in the postseason. Tuesday, on a 55-degree day with little wind, Freeport hosted a quarterfinal for the first time since 2011 and did so in Freeport for the first time in a decade (the 2011 contest was moved to Yarmouth’s turf field due to poor weather and field conditions) and for the first time since a 3-1 win over Lisbon in the 2002 Western A quarterfinals, the Falcons were hoping to punch their ticket to the semifinals, but Lake Region carried play most of the day and was able to get its offense going in the second half to advance. The first half didn’t produce many scoring chances, but the Lakers had the ball in Freeport’s end most of the time. A little over two minutes in, Lake Region earned its first penalty corner, but a shot from senior Hailey Parsons was saved by Falcons junior goalie Katelyn Rouleau. After another Lakers’ corner didn’t produce a shot, Freeport got into the offensive zone in the eighth minute and earned a corner, but the Falcons couldn’t put the ball on cage. With 16:55 to play in the first half, Freeport junior standout Alexa Koenig sent an aerial pass into the box which forced Lake Region senior goalie Maddie Nelson to boot it away at the last second. Four minutes later, the Lakers nearly broke through, as Deschenes set up Davis for a shot, but Rouleau made the save, setting up a corner. On the ensuing corner, out of a scrum, the ball was directed toward the goal, but at the last second, Falcons senior defender Cameryn Pasquale swept it away. In the final minute, Lake Region senior Dessi Berry crossed the ball in front, but it slid through the goal mouth untouched and the contest went to the break deadlocked at 0-0. The Lakers continued their onslaught in the second half and eventually were rewarded. Lake Region got three quick corners and on the third, a back-hander from Davis rolled just wide of the post. With 24:55 to play, the Lakers earned another corner and this time, eight seconds later, they found the cage. The ball was inserted by Meserve to Berry, who got it to Deschenes, who wouldn’t be denied with a blast that eluded the kick of Rouleau and slipped inside the near post for a 1-0 lead. Freeport hoped to answer, but a rush by Anderson was broken up by Nelson and a Falcons’ corner led to a shot by Koenig which went wide. Lake Region then returned to the attack and with 19:11 to play, after stopping a pair of shots, Rouleau trapped the ball under her prone body and a penalty stroke was awarded. Davis did the honors and ripped a low shot just past Rouleau’s right pad, inside the near post to make it 2-0. Wood then called timeout, hoping to inspire a comeback. Indeed, the Falcons did manage to pressure, but Lake Region’s defense didn’t allow a shot. With 9:48 to go, the visitors got even more breathing room, as in transition, Davis passed to Meserve, who fired a shot into the cage to make it 3-0. After Meserve missed just wide on a back-handed shot and Davis hit the post on a corner, Lake Region delivered the coup de grace with 7:04 to play, as out of a scrum, Deschenes rattled the cage for a four-goal advantage. Down the stretch, the Lakers earned three more corners, but couldn’t score and they ran out the clock on their 4-0 victory. York is a formidable foe, not just because of its pedigree (the Wildcats have won 13 straight postseason contests and haven’t lost a playoff game since a 1-0 setback to Nokomis in the 2013 state final), but because it holds a big mental advantage over its opponents, due in part to its tough-to-play-on grass field, superb coaching by Barb Marois and always-spectacular fundamentals. Tuesday, in its quarterfinal, York defeated No. 8 Fryeburg Academy, 3-0. Lake Region twice held 1-0 leads over the Wildcats this fall, but both times York rallied to win by a 2-1 margin, the second time in overtime last week in Naples. Freeport was out-shot, 9-2, and Lake Region took 12 corners to the Falcons’ two. Nelson made a pair of saves for the Lakers, while Rouleau made five stops for a Freeport squad that will be disappointed for awhile over this result. The Falcons graduate Pasquale, Maya Bradbury, Lauren Schenker, Grace Schnyder and Callie Toothaker. Next year’s team will feature a nice blend of veteran leadership with a younger group that got valuable experience this fall. Expect Freeport to be right back in the hunt in 2018. Lake Region junior Paige Davis fires a penalty stroke past Freeport junior goalie Katelyn Rouleau for a 2-0 lead in the second half. Lake Region senior goalie Maddie Nelson kicks the ball away from Freeport junior Kerry Lefebvre.